Jake Morris relied predominantly on one lure along one particular stretch in Lake Barkley last week. Jake Morris came into the 2019 season with one goal in mind: Make the FLW Series championship at Lake Cumberland, which isn�t far from his home in McKee, Ky.
After stumbling in the first event on the Southeastern FLW Series schedule at Lake Okeechobee, he shifted his focus to the Central Division. After one event, which played out last week at Kentucky Lake, his objective now seems far more attainable. 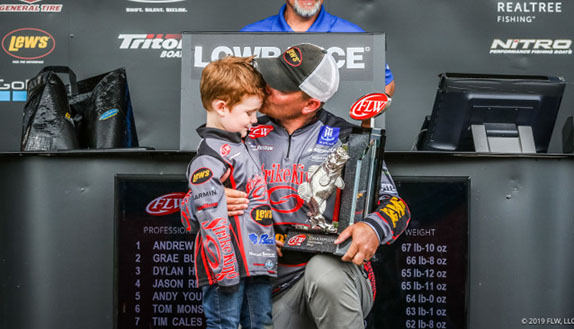 He�ll still need to perform well at Table Rock Lake and Lake of the Ozarks to stay in the top 40 in points, but for now, he�s basking in the afterglow of capturing a win on what has become a real tricky fishery of late. The 147-boat field produced just a total of 11 limits over three days, an excruciatingly low number considering Kentucky Lake�s reputation as a numbers lake. Morris finished with 44-02 and was the lone angler to crack 40 pounds. 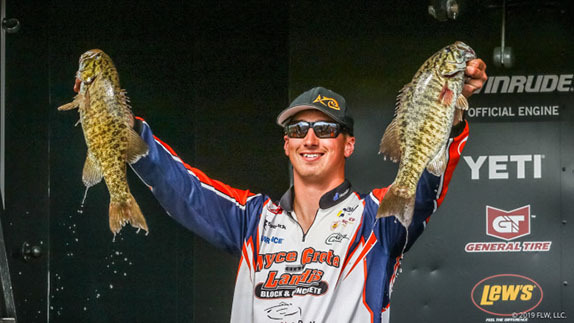 Just six others eclipsed the 30-pound mark in three days of competition. Morris had a dynamite first day with 24-10, then grinded out 13-12 (three fish) on day 2 and 5-12 (two fish) on the final day to close out the victory. Not one of his keepers was caught in Kentucky Lake, though. He geared his focus toward a stretch of bank roughly the length of a football field in the Little River which feeds into the east side of Lake Barkley. He combed the rocky stretch that had scattered wood along it with a 3/8-ounce spinnerbait with a willow-Colorado blade combo. 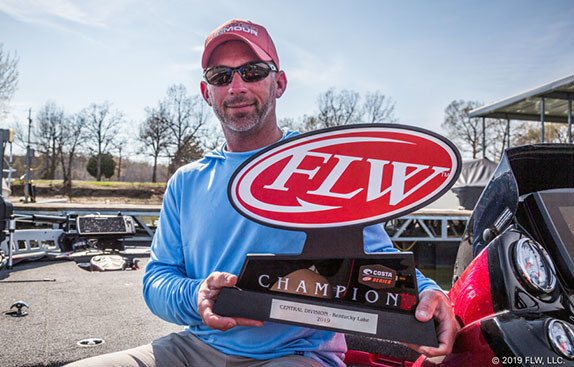 �I never thought anybody would say this, but Barkley can now compete with Kentucky Lake, said Morris, who also won a three-day BFL Regional at Barkley in 2010. With the bass primed to move shallow to commence their spawning ritual, conditions weren�t ideal, but Morris made the most of a ditch that came off a large flat and ran up along the bank. Morris, who does commercial ceiling and flooring work, was quick to credit two old fishing buddies � Paul Lewis and Freddy Adkins � for their role in his triumph last week. Morris started practice last Saturday in the Little River arm of Barkley and never left. He left the dock Thursday morning with three rods on his front deck � two rigged up with spinnerbaits and another with a jig. He saw others with five on each side and didn�t know what to think. By 10:30 a.m. on day 1, though, he figured he�d made the right call location and lure wise. He even caught two fish totaling 11-plus pounds out of the same partially submerged treetop. After sacking 24-10 on day 1, Morris figured he�d be able to put together at least one more decent stringer. Little did he know how tough the fishing would get. He returned to his key stretch in the Little River, where he found the water to be warmer and dirtier than anywhere else he�d been to on Barkley. 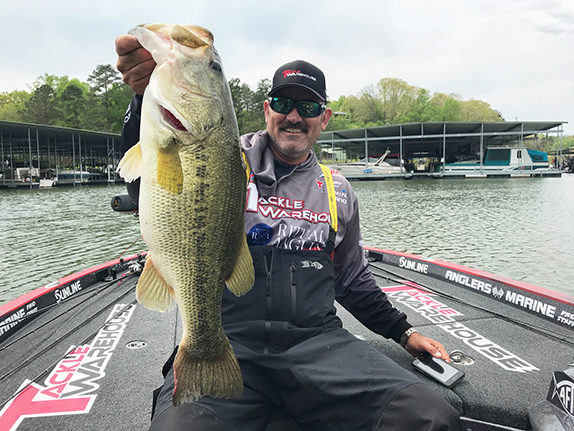 The bite slowed down considerably on day 2 as he caught just two keepers off the stretch before picking off a 6-pounder from a secondary area that he�d found in practice. His 13-12 extended his lead to more than seven pounds entering the final day. Still, he wasn�t sure what to think or feel. �Knowing caliber of guys I was up against, I didn�t think it would happen because at the time I didn�t realize how tough it was,� he added. He said the area he targeted was not an obvious spot that jumps off the map. The combination of chunk rock, blowdowns, driftwood and stumps created an ideal scenario for fish transitioning into their spawning mode. �That�s where the big ones were,� he added. It didn�t take long on day 3 for him to get the sense the well was starting to run dry. �There were only so many fish in that little ditch and by Saturday, it had petered out,� he said. He made the trip back to weigh-in with just two fish in his livewell and a head full of doubt. While runner-up Steve Floyd and third-place finisher Shawn Kowal both bagged limits on Saturday, none of the rest of the finalists mustered more than two fish. �I�m very, very thankful for that 24 pounds on Thursday, but I was just as proud of those two 3-pounders I caught Saturday,� Morris added. > Spinnerbait gear: 7�2� medium-heavy Lew�s TP1 Black Speed Stick Series casting rod, Team Lew�s Pro Magnesium Speed Spool casting reel (6.1:1 ratio), 20-pound Seaguar Red Label fluorocarbon line, 3/8-oz. Stan Sloan�s Zorro Bait Company Aggravator spinnerbait (chartreuse/white), Zoom Fat Albert Grub trailer (white). > Morris reconfigured the blades so he had a white Colorado blade on the bottom and a chartreuse willow blade with a red tip on top. > He favored the Red Label line due to its larger diameter which allowed him to fish longer without having to retie as often. > He�s not typically a spinnerbait fisherman, but the water color in the Little River was such that when he pulled the bait through the water, it had a certain �glow� to it that his fishing buddies told him is the key indicator that he had the right combination for the conditions.